***** Location: Japan, Toyama Pref. This is a special festival in the town of Yatsuo in Toyama prefecture, Japan, held each year from September 1 to 3. Yatsuo, a small and quiet mountain village, is decorated with thousands of paper lanterns as it brings much dancing and music, featuring the nostalgia of the traditional stringed instruments of Japan, shamisen　三味線, and Chinese fiddle, kokyuu　胡弓. Etchuu Owara has a 300-year-long history. Its song and dance is tender and elegant, and creates a graceful atmosphere with its melancholic melody. Dancers dressed in identical Happi coats (male) or Yukatas (female) wearing a straw hat dance from sloped street to street in the town that retains a remnant of the old days with its lattice-doors and old warehouses, which looks like a wave of straw hats passing before spectators. At the theater in the Yatsuo Elementary School playground, each Owara preservation society performs its dance. From September 1 to 3 each year, tourists come from all over Japan to Yatsuo, a small town nestled at the foot of the mountains in Nei County, Toyama Prefecture. The attraction is Kaze-no-Bon, a festival that goes back 300 years. 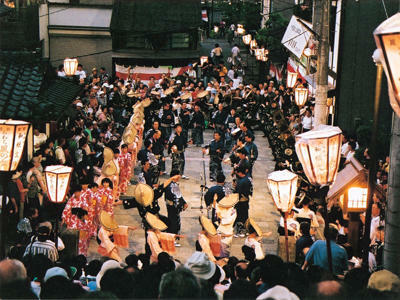 Young men and women wind their way through the streets of their town, dressed in happi (simple, short jackets like kimono) and cotton yukata, dancing to traditional folk songs called owara. The music comes from the three-stringed shamisen, taiko drums and kokyu lutes. 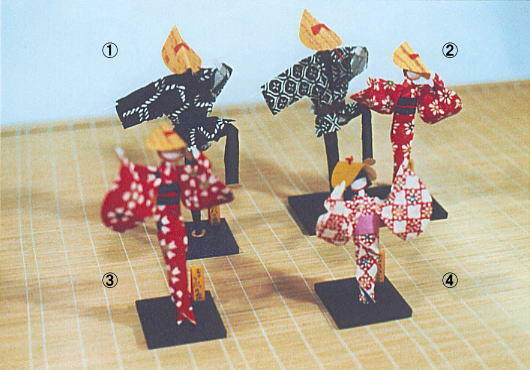 The dancers' elegant movements match the slow, lilting sound of the music and song, creating a unique sense of beauty that makes this Bon dance one of the most interesting in Japan. When the festival first started in the Edo period (1603-1868), dancers wore whatever they wanted and had a good time. The dance was performed around September 1, an "unlucky" day when typhoons were likely to strike. As the festival began to represent the people's prayer for protection from typhoons, the dance and music became soft and gentle, beautiful in appearance and sound. And the name of the festival became Kaze-no-Bon (kaze means "wind," while Bon is the Buddhist All Souls' Day). Actually, there are three types of Bon dance here - one for men, one for women, and one to pray for a good harvest. The dancers hide their faces under braided straw hats in the hope that the spirits will not become overly attached to them. Dance techniques are passed down from the older generation to the younger. Each step, each movement down to the fingertips, is clearly and precisely defined, so there's a lot to learn during the year before the young people are ready for the festival. 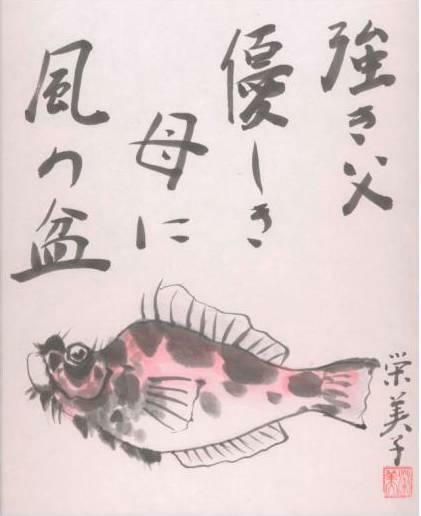 In Yatsuo, the Kaze-no-Bon dance is the culmination of an entire year's effort. One elderly person puts it this way. "We were brought up with the songs and music in our ears. Owara is more than just an art that some people like and others don't - it is a part of us, and we are a part of it." Late at night, after the tourists have gone to bed, the town folk keep singing and dancing. They won't stop until dawn. The men's dance is slow but full of vigor. The Scarecrow Dance depicts work on the farm. Teams from the town's 11 districts compete with each other in a dance. In the women's dance, all dancers are unmarried, between the ages of 15 and 25. No hats are worn during the day. The town of Yatsuo spreads out behind them.